Route 7 (NEW) will provide Express service every 30 minutes between the new Stone Oak Park & Ride and downtown on weekdays during the peak morning and afternoon hours only. Route 12 (NEW) will provide daily Skip service every 30 minutes from the new Stone Oak Park & Ride to the San Antonio International Airport and the North Star Transit Center. Route 503 (NEW) will provide daily service every 30 minutes between the new Stone Oak Park & Ride and the Medical Center Transit Center. Route 2 will be modified to serve the Sonterra Blvd. segment of Route 648. The service to the North Star Transit Center and on Loop 1604 west of Blanco Rd. will be removed. Route 5 will be modified to end at the North Star Transit Center. Service to the San Antonio International Airport will be covered by new Route 12. Route 6 service will modified to operate every 30 minutes on weekdays during the peak hours only. Route 502 will be modified to serve the southern segment of Route 648 on Isom Rd. and the frequency will be improved to every 30 minutes all day. Route 648 will be replaced by the modified service on Routes 2 and 502. Comments may be submitted at the public hearings or in writing through the date provided below. A court reporter/transcriber will be available to accept verbal comments. Written comments may be mailed Attention: Government & Community Relations – January 2018 Service Changes c/o VIA Metropolitan Transit, P.O. Box 12489, San Antonio, Texas 78212, or by email to GCR@viainfo.net. All comments must be received by 5:00 p.m., Wednesday, September 13, 2017, in order to be included in the public hearing record. 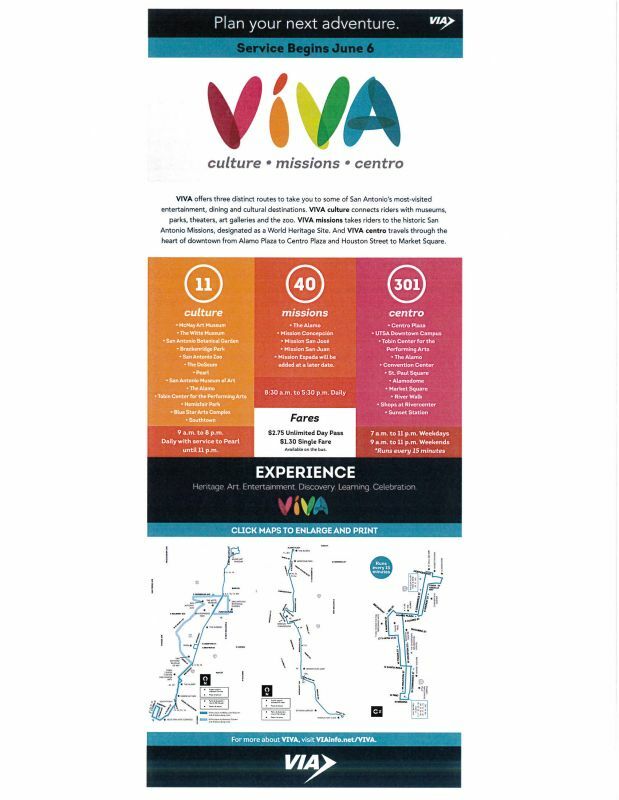 For more information, including maps of some of the proposed changes, please visit www.VIAinfo.net. Para información en español, llame a (210) 362-2075. مقرلا ىلع لاصتالا ىجري ،ىرخأ ةغلب تامولعملا هذه تدرأ اذ ٢٠٧٥ :يلاتلا ‒٣٦٢‒٢١٠ . Nếu bạn cần thông tin trên viết bằng một ngôn ngữ khác, xin hãy gọi số (210) 362-2075. Kung nangangailangan ng impormasiyon sa ibang wika, mangyari lamang na tawagan ang: (210) 362-2075. VIA meeting facilities are wheelchair accessible. Persons with hearing impairments may request an interpreter 48 hours prior to the meeting by calling TDD (210) 362-2019 or call VIA Government & Community Relations at (210) 362-2389.
we'll bring you up-to-date construction closures courtesy of TxDOT. Monday-Tuesday, August 7-8. 9 p.m. until 5 a.m. Southbound main lanes between Marshall Road and Stone Oak Parkway. The right lanes will close while crews set barrier. Tuesday-Thursday, August 8-10. 9 p.m. until 5 a.m. nightly. Southbound main lanes between Stone Oak Parkway and Evans Road. The right lanes will close while crews set barrier. Thursday-Friday, August 10-11. 9 p.m. until 5 a.m. Southbound main lanes between Evans Road and Encino Rio. The right lanes will close while crews set barrier. Monday-Tuesday, August 14-15. 9 p.m. until 5 a.m. Southbound main lanes between Encino Rio and Redland Road. The right lane will close while crews set barrier. Tuesday-Wednesday, August 16-17. 9 p.m. until 5 a.m. Southbound main lanes between Redland Road and Agora Palms Drive. The right lane will close while crews set barrier. Wednesday-Friday, August 16-18. 9 p.m. until 5 a.m. Southbound main lanes at Sonterra Boulevard. The left lane will close while crews set barrier. Membership is not limited to Sonterra residents - contact Julie Golla, Director of Membership, for more information! 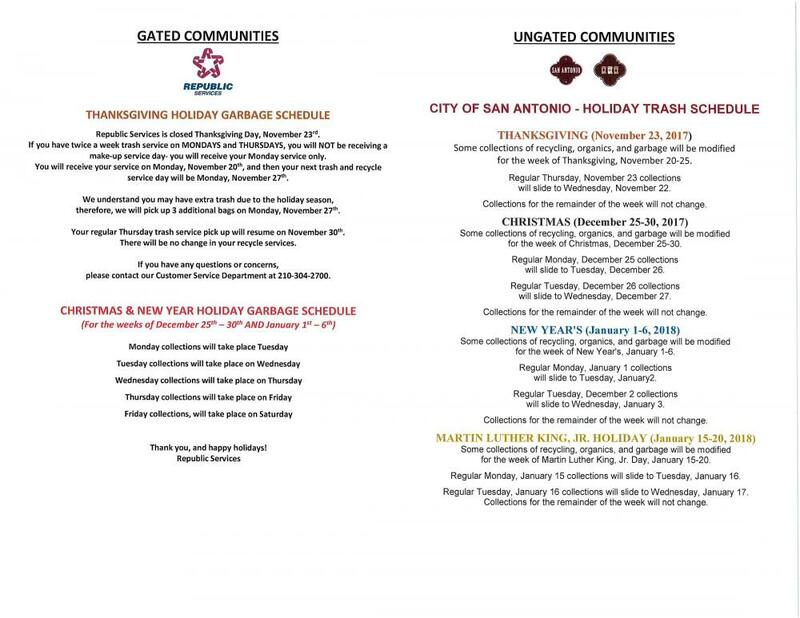 12-7-16 City of San Antonio Mobile Service Requests Made Easy! Make sure the POA has your most up to date contact information! Please make us aware of any changes in mailing address, contact names, phone numbers, or emails. All information is kept private. Complete this form and return it to us as soon as possible: Stone Oak Account Information Change Form.pdf Please note: Do NOT include the completed form with your assessment payment. Completed forms should be dropped at, or mailed to, our office address: 19210 Huebner Road, Suite 100, San Antonio, TX 78258. There is also a 24-hour secure dropbox on the right at our building entrance. Completed forms can also be scanned to mlorente@mgmtco.com or faxed to 210-490-1391. The link below will provide you with information pertaining to garbage pick-up in the Stone Oak gated communities. The City of San Antonio provides service for the non-gated communities. Please note: Do NOT include the completed form with your assessment payment. Completed forms should be dropped at, or mailed to, our office address: 19210 Huebner Road, Suite 100, San Antonio, TX 78258. There is also a 24-hour secure dropbox on the right at our building entrance. Completed forms can also be scanned to mlorente@mgmtco.com or faxed to 210-490-1391.